Lauren Greenfield may not be a household name, but for the past 25 years, she has found a unique artistic voice in analysing significant cultural shifts with a fine-tooth comb. 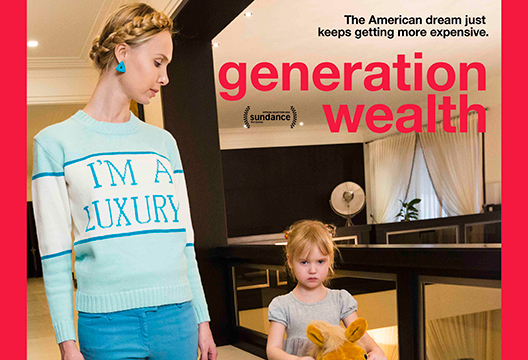 It is a key conceit of her new film, Generation Wealth, that all of these explorations, however diverse, have led to one monolithic phenomenon: wealth culture. Generation Wealth is effectively a forward-looking retrospective. Greenfield presents the best of her previous work to create an entertaining fable about the wealthiest social class in human history, almost as if told from the point of view of a historian detailing the follies that inevitably precede the fall of every ill-conceived empire. A growing wealth culture, Greenfield argues, both produces and feeds upon a warped funhouse mirror version of free-market capitalism. A free market for the few that results in misguided individuals becoming chronically dissatisfied consumers, reduces healthy images of human bodies to those that can only be met through surgery, and promotes an immature and unhealthy view of ageing. Greenfield observes that wealth culture is much more about access to status and an excess of social shame than it is about social mobility, which may explain why, for some, too much is still not enough. Generation Wealth is both inquisitively fun and infuriatingly stomach-turning; but that, Greenfield argues, is the only way to view those so obsessed with wealth that it fuels their sense of inadequacy – a vacancy filled by a fantasy, but at least one you know others will covet. This is, without doubt, a look at the darker side of humanity, but Greenfield’s view is neither exaggerated nor unnecessarily cynical. On the contrary, I think most people who, for example, have had an Instagram account will recognise the inexplicable pace with which any kind of attention has replaced a more traditional definition of the word ‘celebrity’, and how wealth culture is occupying every free space available – literally, figuratively and psychologically – among some young people whose aspirations have become far less personal and more about what would garner social status. This question lingers painfully rather than wistfully in the film’s aftermath. See it.